Stay in our cabin accommodation, tent or powered campsite in beautiful Pukenui in the Far North of Northland New Zealand. Mum and dad and my sister and me stayed there at Christmas. 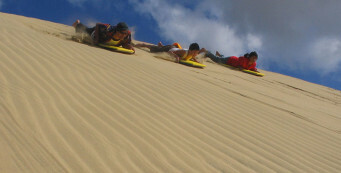 The best time was when we went to the sand dunes. They were big. Dad got us some sleds so we could ride down them. Mum thought we would hurt ourselves but we didn’t. It was hard to go to the top but easy to slide down. Me and my sister got covered in sand. Mum said the camp might not want us in the showers. Jo said dont worry there is plenty of hot water. Mum was pleased.